"Alternatives to declawing your cat make this surgical procedure absolutely unnecessary." Many people think that removing their cat's claws is a simple procedure. In fact, it is a surgical procedure (called an onychectomy) where an entire section of each of your cat's toes is amputated. Your cat or kitten will have to be anesthetized for the procedure (which has its own potential dangers). It's similar to having your own fingers amputated at the first joint. Veterinarians will often combine onychectomy surgery with sterilization surgery. The one advantage of this is that it helps avoid your cat from having to be under anesthesia for an additional time. If done separately, your cat or kitten will have to recover from two separate surgical procedures. If done together, he or she will have to recover from two surgeries at one time. Is Declawing Your Cat Ever Necessary? Removing your cat's nails is rarely ever considered medically or behaviorally necessary. And surgery on all four paws is very rarely justified. Many cats and kittens recover from the surgical procedure with few or no complications. The pain experienced from the amputation surgery could be minimal, post-surgery pain. However, some felines experience severe pain after the surgery, and others will experience chronic pain after having their claws removed. There may be bleeding and infections, nail regrowth, loss of feeling in the toes, and lifelong sensitivity. Possible infections from the procedure could require additional surgery. Behavioral problems can also occur after cat declawing. The Humane Society of the United States says that many animal shelters report that a large number of declawed cats are surrendered by their people due to biting and litter box problems. One possible cause of the litter box problems is from having to use a different litter box filler after surgery. Shredded newspaper is often recommended for the litter box after surgery to protect your cat's tender toes and to try to reduce the irritation from regular cat litter. Your cat may not like the new filler and may use other places in your home to take care of business. For some cats, the sensitivity will be a lifelong issue and this could cause litter box problems for the rest of your kitty's life. If you decide you absolutely must take the very extreme measure of having your cat's toes partially amputated, be sure to follow your veterinarian's post-surgery recommendations closely to try to avoid any additional health problems. A cat or kitten who goes outside with no claws cannot defend herself from other cats, dogs, or other predators. In addition, your cat's ability to climb trees and to escape from harmful animals will be seriously affected. 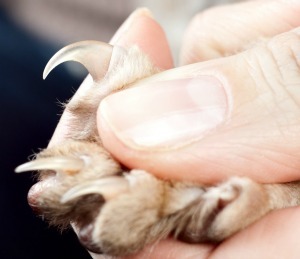 Declawing an outdoor cat is very rarely a good idea. Why Does Your Cat Scratch Anyway? Cat scratching is an innate and necessary behavior for your cat; it serves various health functions for your kitty. Not only does scratching take care of your cat's nails, but it also serves the important function of keeping the muscles in his legs, shoulders, and back toned. Your cat is not intending to be destructive or disobedient when she scratches your best furniture! If you're concerned about damage to your furniture, there are plenty of safe and humane ways to protect your furniture. The best way to protect your furniture is to train your cat to use a scratching post, or other scratching alternative, such as a cardboard scratcher. Or like most cat lovers who share their homes with healthy cats, sometimes you just learn to live with a few furniture scratches. Covering your furniture with double-sided adhesive tape. If you're considering having your cat's claws removed, please, please consider all other possible alternatives first. Your cat's behavior can be modified and she can be retrained. Declawing should only be considered as an absolute last resort, if ever. The potential disadvantages and pain to your cat do not outweigh the possible benefits. In the mid-80s, I made the decision to have my beloved cat, Max, declawed. I didn't know any better. My veterinarian did not warn me of any of the possible side effects, and did not tell me about any of the alternative measures I could have taken. For his entire life, Max's paws were sensitive to the touch. Fortunately, he was an indoor cat, so he didn't have protection problems. Years afterwards, I realized what I had done to the little guy. It took me a long while to forgive myself for hurting him as I did. I've had three other kitties since Max passed, and I've never ever considered cat declawing for any of them. Every cat parent must make his or her own decision, but I hope you will look for all alternatives before you decide to do this procedure. Trimming Cat Claws - How to safely trim your cat's nails. Cat Scratching Posts - How to choose the best cat scratching post.